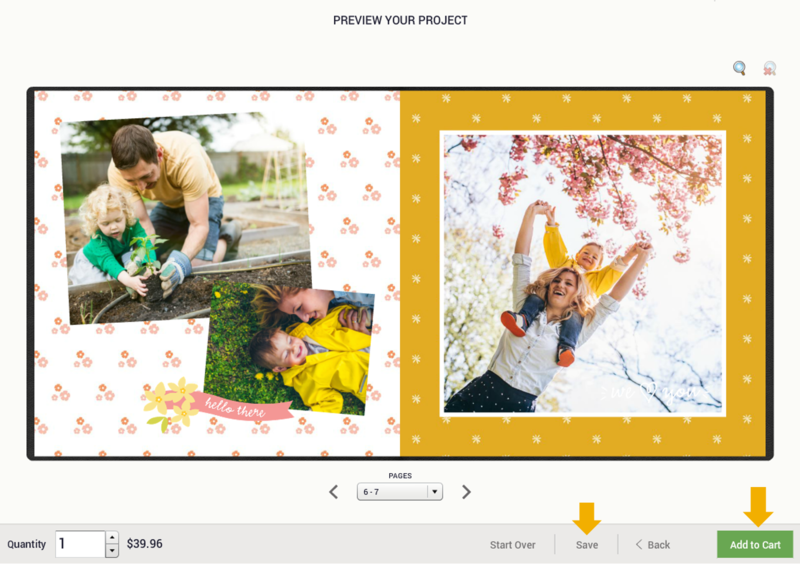 Now that you have chosen a photo book and set your options, start designing your Custom Photo Book by choosing a theme. Photo book themes are categorized into folders in the Themes panel at the bottom. Click on a theme to flip through the various pages of the design preview. When you have chosen your preferred theme, click Next Step at the bottom of the page. You will now select photos to add to your book. All photos uploaded to your Sam’s Club Photo account are organized by year, then by album in the My Photos panel at the bottom. Click on an album to view all of its photos. Place your mouse over a photo's thumbnail in the tab to see a larger preview. The number of photos recommended for your selected photo book will be stated at the top. Selecting fewer photos may leave empty pages in your book. If you would like to use more photos, you can purchase additional pages. To save time, select photos in the order that you want them to appear in your book. Click on a photo from your album(s) to add it to your selection. To add all of the photos from an album, click Add all. To add photos from another album, click on the circular file icon on the left, navigate to the desired album, and click to select photos to add to your book. The selected photos will appear in the photo book in the order that the thumbnails appear on the photo selection screen. To rearrange the order of your photos, click and drag a photo thumbnail to the preferred order. To arrange photos by the date they were uploaded, click Sort by date in the top right. To remove an individual photo from your selection, place your mouse over its thumbnail and click the red "x" icon. To remove all selected photos and start fresh, click Remove all in the top right. Once you have selected the suggested minimum number of photos, the red indicator at the top will turn green (or yellow). When you are happy with your photo selection, click Next Step at the bottom. 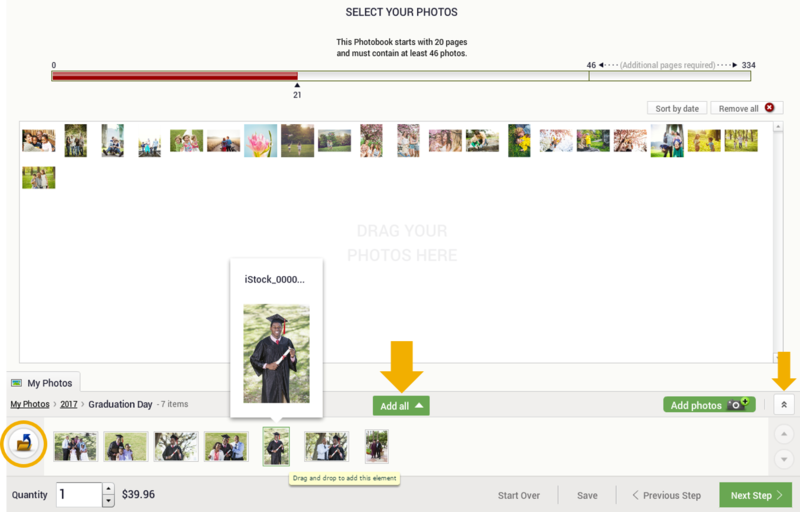 Your photo book will now automatically populate with your selected photos. Click on the thumbnails at the bottom of the screen to navigate to a page in the book, or use the arrows to flip through. To add your finishing touches, there are a number of ways to edit your photo book. Please note that not all of the following features are available for the Mini Book or FlipBook. Buttons – The global buttons are in the top right, including undo, redo, cut, copy, paste, zoom in and zoom out. If available, directly above the preview will be the background unifier icon. Click the icon to share the background, graphics, and text across both pages on the screen, or click it a second time to split the page designs. Work table – The work table is the quick access bar on either side of your book preview. You can drag and drop a photo from the My Photos tab at the bottom or from any page of your book to the work table to temporarily store it while you make edits. This is the easiest way to move a photo to a different page. Photo editing toolbar – Clicking on a photo in your book will open the photo editing tools, which allow you to move, resize, rotate, crop and more. You can also click Edit photo to add black & white or sepia filters, fix red-eye, zoom and pan your photo. When you’re done editing, click Accept. Seam margin – When you place your mouse over a page, you may see a red shaded area appear near the center of the book. This is the seam margin. It is strongly recommended that you do not place photos, clipart, or text in the seam margin. At the bottom of the workspace is a series of tabs, providing you with advanced book editing features. Not all tabs are available for every type of Photo Book. This tab displays preview thumbnails for each page in your photo book. Click on a thumbnail to view and edit that page. Drag and drop page thumbnails to reorder pages in your book. Click Add Sheet to add a pair of pages to your book. If you have more than 20 pages (the minimum for a photo book) you can remove a pair of pages by clicking on its thumbnail and then clicking Remove Sheet. This tab is identical to the My Photos tab under the Select Your Photos section above. Any photo that currently appears in your book will be shaded and feature a checkmark icon. This tab displays dozens of available page layouts. A page layout determines how many photos appear on a page, the size of the photos, and the location of photo and text areas. Change a page layout: Click on the page you wish to change and select the Layouts tab. Open the Layouts folder. Drag and drop the desired layout onto the page. If the new template has fewer photos than the existing page, any extra photos will be moved to the work table. This tab displays the collection of clipart imagery that can be added to your book. Clipart is organized into categories. If your photo book theme includes a selection of clipart, you can be consistent by choosing artwork from the Used clipart folder. Using clipart: Drag and drop your desired clipart to any part of the page. Once placed, you can resize and rotate clipart from the popup menu. To delete clipart, drag it off the page. 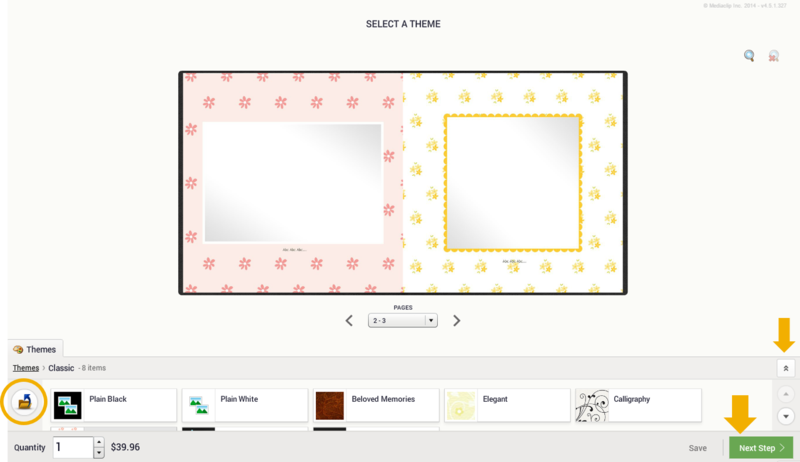 This tab displays all of the available backgrounds that can be used in your photo book, organized by category. 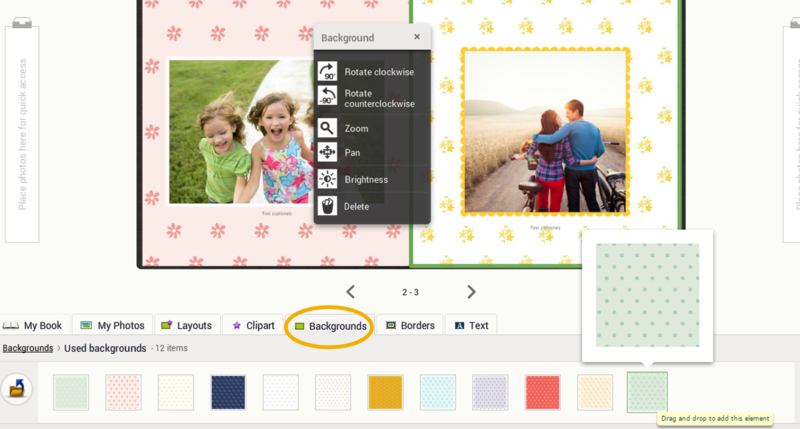 Themes automatically assign coordinating backgrounds to each page, which can be modified. To stay consistent with your theme, choose backgrounds from the Used backgrounds folder. Change a page background: Click on the page you wish to change and select the Backgrounds tab. Browse through the folders to find a preferred design, then drag and drop the background onto the page. Once placed, you can rotate and pan the background image with the pop-up menu. This tab displays all of the available borders, drop shadows and masks, which can be applied to photos and text boxes. Themes automatically include a selection of borders, which can be modified. To stay consistent with your theme, choose borders from the Used borders folder. Using borders: Click on the page in which you would like to add a border to an element, then select the Borders tab. 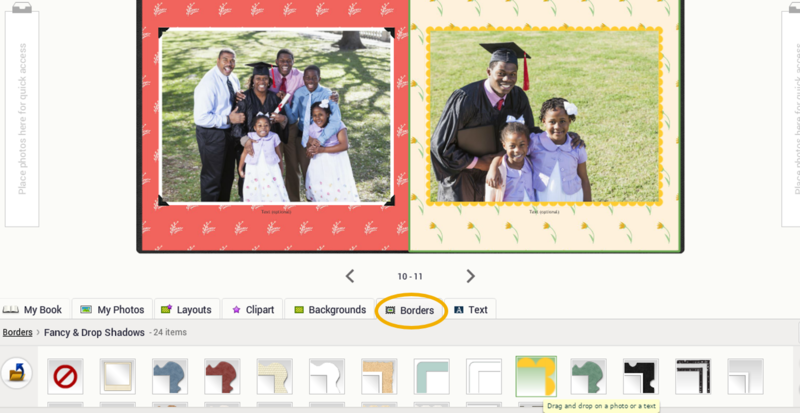 Browse through the folders to find a preferred border, then drag and drop it on the photo or text box. To remove a border, drag and drop the no border icon onto the element. You may need to adjust the way your photo sits inside its new border by clicking on the photo and selecting Edit Photo from the pop-up menu. This tab allows you to edit text or add additional text boxes to your design. To edit text: Click on a text box in your design to open the Text tab. Type in your caption and use the formatting options to style the font type, size, color, alignment and more. Then, click Done. To add a text box: Click on the Text tab and drag and drop the "ABC" button onto the page. Then, edit text with the formatting tools. When you have finished making changes to your photo book, click Preview in the bottom right. You can now flip through every page of your book. If you need to make changes, click Back. If everything looks great, click Add to Cart. 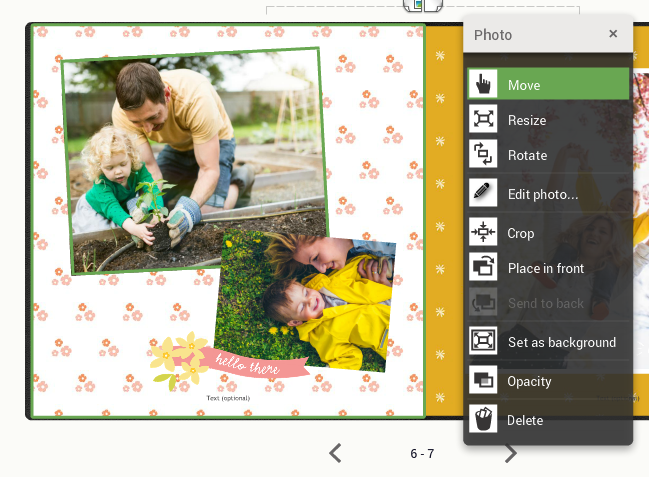 You can save your photo book project at any time by clicking Save. To find your project later, select View Photos from the main menu and then open the Projects tab.